WELCOME TO THE ZONIAN LIFE! ONCE LIVED IN THE PANAMA CANAL ZONE. The Panama Canal Zone... a former unincorporated territory of the United States from 1903 to 1979, was centered around the Panama Canal in the Republic of Panama. 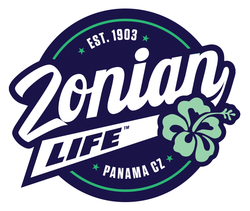 Incredibly rich with historical significance for both the United States and Panama, it's the culture, pride, and life lived by those who inhabited the Canal Zone that Zonian Life® celebrates. Today's "Zonians" are a very displaced but uniquely close-knit community that is extremely prideful and celebratory of their Canal Zone heritage. For many, the positive life experience and wonderful memories made while working and living in Panama absolutely form the core friendships and values of the life they now live. Simply put... Zonian Life was an idyllic and blessed life. It was a great life and they still LIVE IT LOUD! Explaining this "CZ Pride" to others who haven't lived it can be hard. Most often it leads to a simple shoulder shrug, an easy Zonian smile, and another round of cervezas! 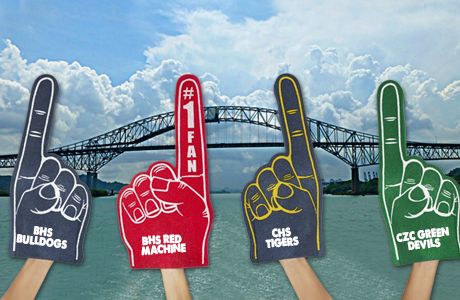 Some of our most cherished memories and friendships were forged during time spent in a Canal Zone school. Gotta love those "Property of Division of Schools" gym shorts! Almost every Zonian has experienced the sadness of having to leave the Canal Zone. Fortunately, as we age this sadness has turned to a warm sense of nostalgia.